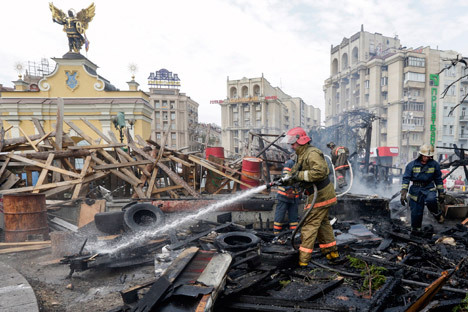 RBTH presents a selection of views from leading Russian media on the latest developments in Ukraine, including a potential disaster in waiting at a chemical plant in Gorlovka, a peace plan proposed by Belarusian President Alexander Lukashenko, and a possible agreement to supply Lugansk with humanitarian aid via the Red Cross. Moskovsky Komsomolets reports that the Ukrainian army’s continued shelling of the Stirol plant in Gorlovka – one of the largest chemical plants in Ukraine – may lead to an environmental disaster. The newspaper quotes the company’s press secretary Pavel Brykov, who noted that the accident at Stirol could result in a leak at the Gorlovka state-owned chemical factory, where chlorobenzene [a flammable solvent – RBTH] is still stored. The minimum radius of the disaster area of such a leak, as reported in the newspaper, would be at least 300 kilometers [200 miles]. Nezavisimaya Gazeta publishes news that the president of Belarus, Alexander Lukashenko, has a plan to settle the conflict in Ukraine. The newspaper reports that Lukashenko has announced a meeting of heads of states of the Customs Union with the Ukrainian president Petro Poroshenko and has declared he has a plan to settle the conflict. Vedomosti writes that during talks with U.S. Vice-President Joe Biden and German Chancellor Angela Merkel on August 9, Poroshenko said that Ukraine is ready to accept aid for Lugansk under the auspices of the International Committee of the Red Cross. However, it must remain under the control of the Ukrainian military through controlled border crossing points on the Ukrainian side, and it may not be accompanied by any foreign military support. According to Novaya Gazeta, five Ukrainian officers detained earlier in the Rostov Region in Russia have returned home. The newspaper writes that they will not be prosecuted, as the commander of the 72th Brigade Ivan Voytenko and four of his fellow soldiers were following the orders of their superior officers and did not commit any direct crimes against individuals. Novaya Gazeta recalls that Ukrainian forces are suspected of using internationally banned weapons, as well as of having shelled Russian territory. Moreover, officers are suspected of involvement in crimes against civilians in the Lugansk and Donetsk regions.